NEW ORLEANS – Something wasn’t right. 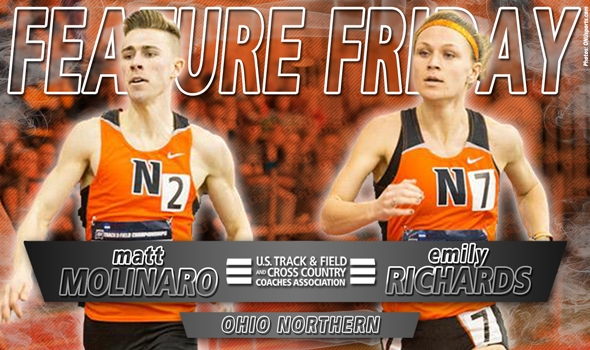 Ohio Northern’s Emily Richards had just won her 1st NCAA title last May at the NCAA Division III Outdoor Track & Field Championships in the 800, but felt as if she only half-accomplished her goals despite ending her sophomore year atop the podium. That’s because teammate and partner-in-crime Matt Molinaro couldn’t compete for his own NCAA 800-meter title after being disqualified in the prelims due to a lane violation. Molinaro entered the meet ranked 2nd nationally right behind eventual champion Mitchell Black (1:48.60 to 1:48.99), so if he were able to run in the final, chances are the race would have gone down to the wire to determine who was the King of the Outdoor Half-Mile in DIII. If Molinaro matched Richards’ victory, they would have become just the 4th set of teammates in NCAA history to sweep the 800-meter titles at the same NCAA Outdoor Championships. NCAA Division II powerhouse Adams State last accomplished that feat in 2006 when Nick Lara and Victoria Martinez crossed the finish line 1st in their respective finals. Before that it was NCAA DIII UW-Oshkosh in 2002 with Matt Groose and Liz Woodworth, preceded by then-NCAA DII Cal Poly in 1982 with Vernon Sallaz and Esther Scherzinger. It has never happened in NCAA Division I. If all goes according to plan, Molinaro and Richards will have two more cracks at putting their name in the record books together. Molinaro and Richards are both juniors and at the top of their games entering the 2017 outdoor season. Earlier this month at the NCAA Division III Indoor Track & Field Championships, Richards won both the 800 and mile by a comfortable margin. That capped an indoor season where Richards also became the 6th fastest woman over 800 meters in NCAA DIII history (2:08.83). Richards was already the 3rd fastest woman in NCAA DIII history outdoors (2:05.54). Molinaro finished runner-up in the 800 to Washington (Mo. )’s Deko Ricketts. He worked his way up the pack after a slow start, but couldn’t overcome Ricketts down the stretch. The progression of both Molinaro and Richards in the span of a few years has been nothing short of remarkable. Molinaro, who focused on the 800 in high school, dropped his outdoor PR from 1:52.25 to 1:48.99 and is knocking on the door of the all-time top-10. If Molinaro lowers his PR one second, he’d move up to 4th on the all-time list and leapfrog former ONU standout Jimmy O’Brien in the process (7th, 1:48.45). Richards, a converted sprinter, went from 2:20.53 in her first 800 to “thinking (she) was going to die” after running 2:07.50 at the Raleigh Relays last year to setting her sights on the NCAA DIII standard of 2:02.95, established by Christy Cazzola in 2014. Of note: Richards ran the 10th fastest time in NCAA DIII history over 1500 meters at the Raleigh Relays this year (4:23.21). Both credit Maus’ increased interval workout (200- to 300-meter ladder using 20-meter increments per rep) as a critical building block to their success, but it goes deeper than that. Richards agreed with Molinaro’s sentiments. “It’s awesome because you’re not doing it on your own,” Richards said. “It’s great to experience success with someone else.